Echinacea Angustifolia Capsules - 450 mg, 60 Vcaps™ each - Penn Herb Co. Ltd.
Echinacea is still the choice for those who value the time-tested, traditional approach to reinforcing immune health. At the first sign of symptoms, reach for Echinacea protection. It jump-starts your natural defenses, especially during vulnerable periods. Herbalist Hint: Echinacea angustifolia and Echinacea purpurea are two of the most commonly used varieties. They have similar immune-supporting properties and can be combined for a more comprehensive defense. 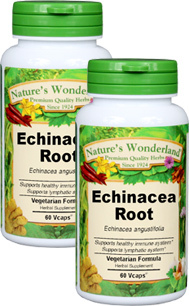 Echinacea angustifolia contains a higher concentration of echinacosides, a potent class of antioxidant compounds. COMMON NAMES: Narrow Leaf Coneflower, American Coneflower. Support healthy immune function; supports lymphatic system; supports glandular health; respiratory tract health; throat gargle. NOTE: Some herbalists recommend using Echinacea for no longer than 6-8 consecutive weeks. Skin health; blood purifier; bladder, prostate & urinary tract health. As an addition to the diet, take 1 or 2 capsules, three times daily with water at mealtimes. CONSULT YOUR HEALTHCARE PRACTITIONER BEFORE USING ECHINACEA IF YOU HAVE AN AUTOIMMUNE CONDITION.